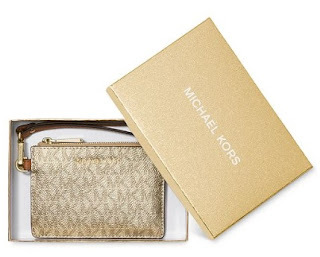 The Target Saver: Macy's: Michael Kors Boxed Metallic Signature Coin Purse- $34.80 Shipped! Macy's: Michael Kors Boxed Metallic Signature Coin Purse- $34.80 Shipped! Hurry, today only 11/28 you can score this MICHAEL Michael Kors Boxed Metallic Signature Coin Purse for only $34.80! A little logo print goes a long way on the pair-with-anything MICHAEL Michael Kors Metallic Signature Coin Purse. Shipping is FREE with orders over $25.00. Get your shopping started here!